You can submit to most Elsevier journals using an online system, either the Elsevier Editorial System (EES) or Elsevier’s new system EVISE®. The system you use will depend on the journal. Follow the ‘Submit Your Paper’ link on your journal's homepage. You’ll be taken to EES or EVISE® and will be prompted to log in. If you’re using the system for the first time, follow the instructions to register. If you’re returning, log in. Once you’re in the system, you will be guided through the submission process. When you have completed your submission, you’ll receive an email with a reference number you can use to check the status of your submission. The journal editor will make a first decision about your submission. If it’s suitable for the journal, the editor will send your manuscript to one or more reviewers – experts in your field. The peer review process acts as a filter to ensure only good research is published, and improves the quality of research submitted for publication by giving reviewers the opportunity to suggest improvements. To learn more about peer review, visit the Elsevier Researcher Academy topic on "Navigating peer review". We support open access in our journals; find out more out your options on the open access pages. 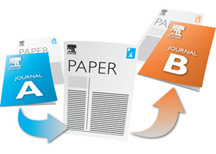 If your manuscript is deemed unsuitable for publication in your chosen journal, the editor may suggest you transfer your submission to a more suitable journal, via Elsevier’s Article Transfer Service. If you agree to this, your manuscript will be transferred with no need to reformat. When submitting your article or your article revisions to a Elsevier journal, you'll find solutions to share your research data with your article directly within the EVISE submission system. For example, you can upload your research data to Mendeley Data, link to research data hosted in repositories or co-submit a data or methods article. You can also include interactive data visualisations with your article. Check the Guide for Authors of the journal of your choice to see what solutions they support.